Success is not always easy. If you’ve done your job right you’ve got a whole bunch of people, a lot of customers and probably a whole lot of problems. Some of them are new. Some of them are familiar. Some more frequent. And some of them are worse. If you’re getting bad advice people will be telling you that you need to let go, empower people, TRUST them to do their jobs. Hopefully you know, or someone around you is telling you, to focus on building INFRASTRUCTURE, the systems and processes critical to efficiency and stability and your ability to SCALE. But knowing that you need to build systems and processes will not, by itself, solve your problem. How do you figure out what to work on or where to start? Every organization has infrastructure. 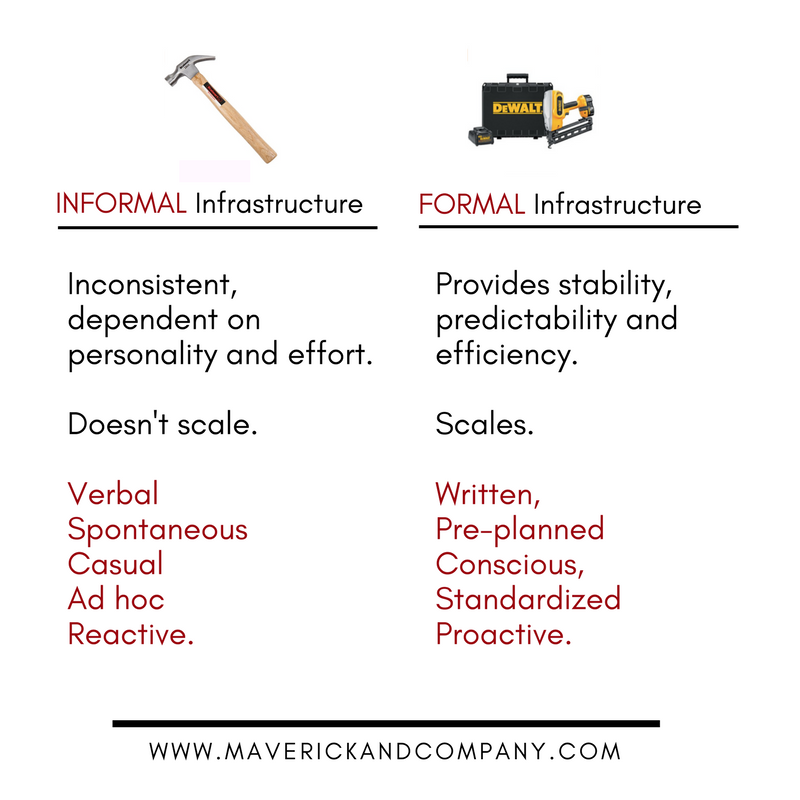 Your infrastructure includes all the formal and informal structures you have for getting work done. Your infrastructure is how supplies get ordered, decisions get made, priorities get picked, work gets assigned, paychecks get written and new people get trained. INFRASTRUCTURE is all the elements of your business that make it possible to get work done. Includes your systems, processes, structures, culture, training, habits, resources and management. It’s the way you gather and communicate information, organize people and resources, plan and make decisions, track and manage work. INFORMAL Infrastructure tends to be verbal, spontaneous, casual, ad hoc and reactive. Example: Informal training usually looks like a more experienced person showing the new person how things work. They remember or decide in the moment what needs to be covered. FORMAL Infrastructure is written, pre-planned, conscious, standardized and proactive. Example: Formal training could be as simple as a basic checklist of topics that need to be covered or as elaborate as a formal training manual with testing to make sure the material is actually learned and a record of training is created and filed. Developing your formal infrastructure doesn’t mean writing a 15-page manual for how to go to the bathroom. You don’t have to build it all, all at once. You don’t have to lose your soul or your sanity. You can build structures that help preserve your freedom and protect your culture. You can make it easier for good people to do great work and WIN. You can kill problems and frustration, create stability and protect your quality and your money. It’s not just about scale. It’s about smart. Start by looking at the places where growth has broken the informal systems that used to work and replace the most important ones with formal systems that DO. You don’t do it all at once. You prioritize. You chose what to work on first and what to work on next and what not to work on at all. 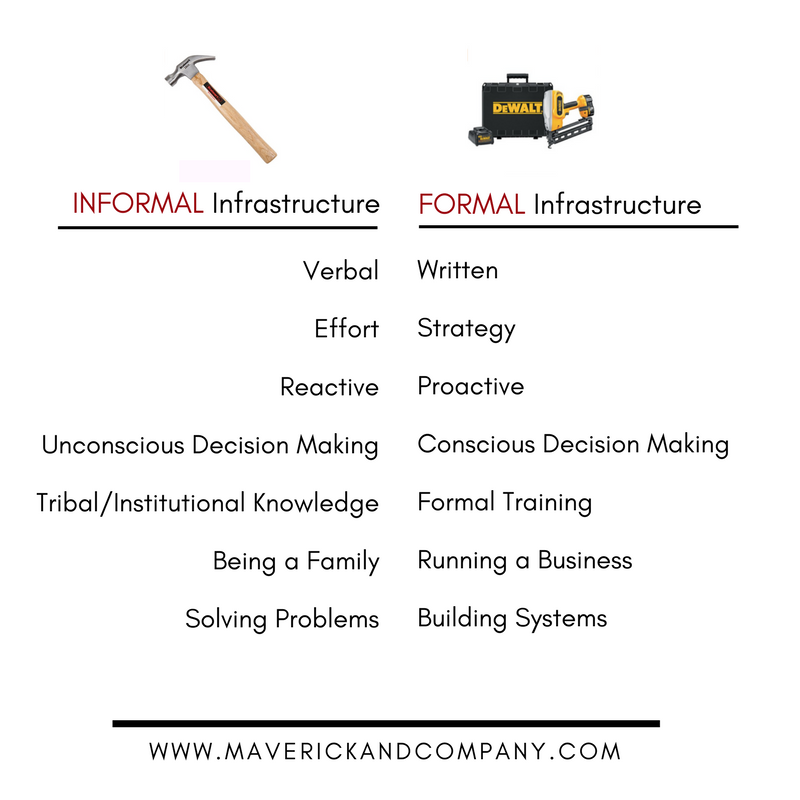 It’s a process of going from informal to formal. It’s a mistake to be too informal. Too much shooting from the hip makes it easy to miss things or make mistakes. It’s also a problem to be too formal and create so many rules and regulations and systems that your infrastructure actually makes it harder to get work done. They key is to find a balance between the two that fits the culture, goals and current needs of the organization. What matters is what is EFFECTIVE. 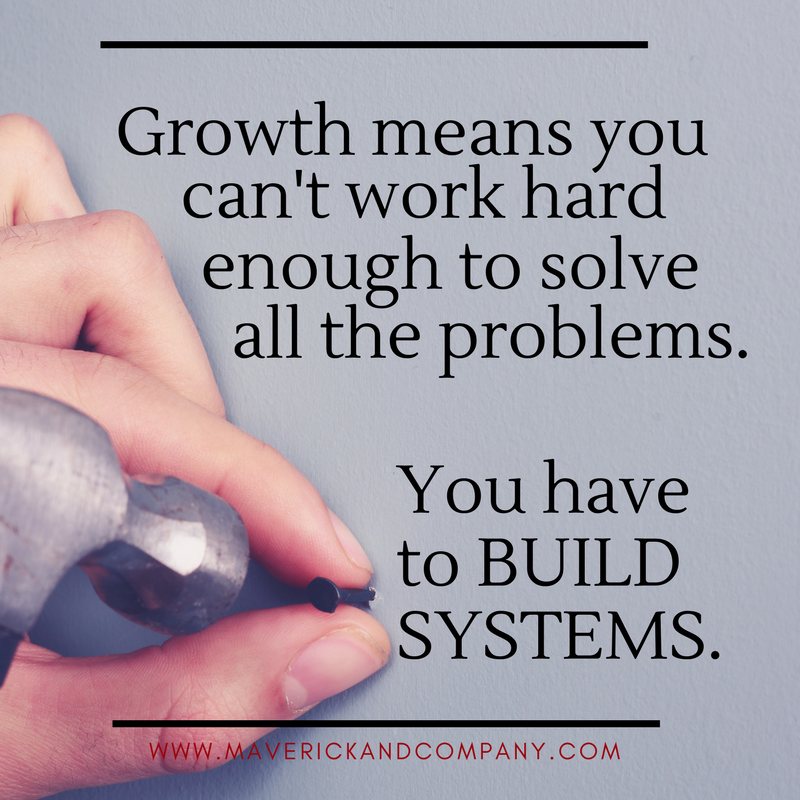 If you’ve grown significantly then your informal systems have probably begun to breakdown. It’s time to shift from solving problems to building structures, from effort to strategy, from working IN your business to working ON your business. * You can’t just work harder. You have to work smarter and with a very different focus. A (free) detailed guide for fast-growing companies to help you understand how growth changes things and what to do about it. Read HERE. About the Author: Alecia Huck is a hard person to find and a good person to know. She specializes in working with fast-growth companies who need to learn the block & tackle skills of leadership; how to hold people accountable, run great meetings, keep track of people and work--the kind of tactical support that it is really hard to win without. Find out more HERE.